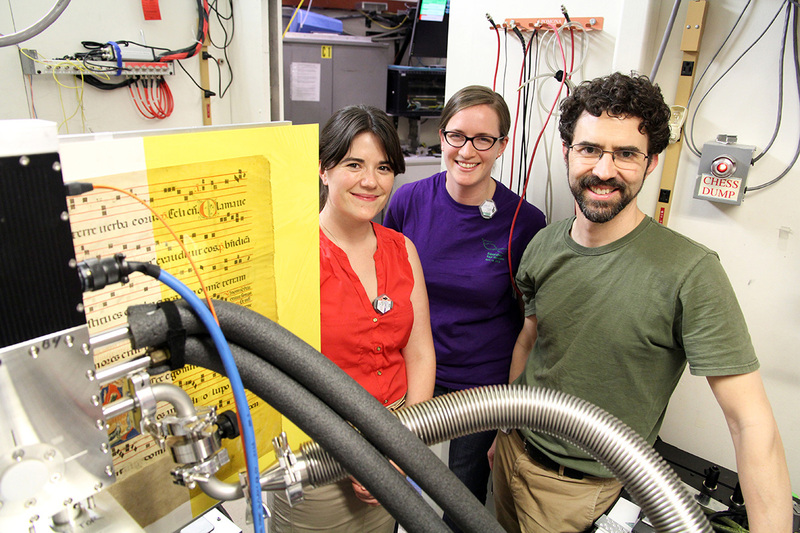 Louisa Smieska and Ruth Mullett studied manuscript pages from Cornell University Library’s Division of Rare and Manuscript Collections (RMC), dating from the 13th to the 16th centuries, using X-ray fluorescence (XRF) and spectral imaging analysis. Their research, published June 23 in the journal Applied Physics A, was co-authored by Laurent Ferri, RMC’s curator of pre-1800 collections, and CHESS scientist Arthur Woll. XRF measures X-rays emitted by atoms to probe the chemical elements present in an object. The p-XRF survey found interesting mineral impurities in a common blue pigment made from the copper mineral azurite. The team then selected seven of the most interesting fragments to study, using the more powerful facilities at CHESS. Identifying which trace elements are present and in what amounts can give a unique fingerprint to a pigment, which may help link scattered pages in different collections. The impurities and trace elements are also potentially significant indicators of where the pigments originated, and can aid in other historic and scientific inquiries. Smieska, M.S. ’12, Ph.D. ’15, took on the project as a postdoctoral researcher at CHESS after completing her doctorate in chemistry. How it evolved – and how the medievalist, the curator and the scientists came together – is a story of Cornell connections, hinging (mostly) on Mellon courses at the Herbert F. Johnson Museum of Art. Smieska first discovered Cornell had illuminated manuscripts thanks to Mullett’s final project in the Mellon Curatorial Practicum they took in spring 2014. She met Woll in the Art|Science Intersections course the following spring – “my introduction to the technique of XRF mapping,” she said. This led her to work for Woll at CHESS last year and an XRF mapping workshop she led for researchers interested in cultural heritage. Ferri was among the participants. “He suggested that we examine the blue pigments in the illuminated manuscript fragments that it happened Ruth had been cataloging,” Smieska said. Pigment analysis can help in provenance research to link far-flung manuscript pages and even reconcile them to their original book sources. Other benefits for conservators, historians, geologists and others include “the potential to learn more about trade routes, historic mining sites, and the regional use of pigments and ingredients,” Mullett said. Cornell’s collection of illuminated pages spans the 9th to the 16th centuries. Such fragments are flat and more conducive to imaging tools than complete volumes, Ferri said. Mullett is a fellow in the Fragmentarium project based at the University of Fribourg in Switzerland, which is building a database of fragments from different institutions. “I’d be really excited to see this project continue. There’s a potentially enormous sample set out there,” Smieska said.